Choose a close connection Mild Climate wall faucet for non-freezing environments. Anti-siphon protection with integral check valve and atmospheric vent are all built-in to make the Model 101 the right choice to meet code and architectural aesthetics. Provide hot and cold water to wash the car, the windows or the dog. Choose Horizontal or Vertical configuration with anti-siphon protection, integral check valve and atmospheric vent. This Close Coupled version of the freezeless Model 30 fits within a 2 X 4 stud wall and drains automatically with or without an attached hose. Also available with a composite box, door and fascia. Choose No Anti-Siphon protection, Single Check Anti-Siphon or Double Check Backflow Protected Models. 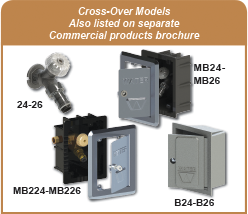 The 24 & 26 are available as individual units or protected inside lockable brass or lightweight modular box models. Never enter a building to shut off the water again. A convenient integral water supply stop is designed into the faucet head. A slotted valve stem can be turned with a flat head screwdriver to stop or resume water flow. These units are protected inside a strong, light weight (3.3 lbs) modular box and Stainless Steel Door and Fascia. A ½-14 FPT inlet connection projects through the side of the box. The chrome plated brass head looks great on any commercial building where hot and cold water service is required. This Backflow Protected close coupled faucet is available as an exposed head or chrome plated brass box model. Loose Tee Key operated rectangular, recessed and flush mounting chrome plated brass heads make these the heavy duty solution. The Model 75 and 79 features a 3/4” FPT 90° X 360° Swivel Inlet that fits inside a 4” wall. Choose single check anti-siphon or double check backflow preventer models. All hydrants are available with rectangular or round brass box and door.